Lehigh Valley (49-37) Beat Scranton, 4-3 in 10 innings on J.P. Crawford’s first home run since his promotion to AAA. Anthony Vasquez settled down after allowing 3 runs on 2 HR in the first inning. Edward Mujica eventually got his 22nd save. Crawford, Andrew Knapp, and Cameron Perkins (.281) had 2 hits apiece. Perkins stop a 5-42 slide that saw his average plummet to .278. #1 Crawford (.242) went 2-5 with a HR (1) and RBI (13). #2 Thompson (6-5, 2.76) – DNP. #3 Williams (.289) went 1-4 with a SF and RBI (41). #4 Appel – DL, season-ending surgery to remove a bone spur. #9 Knapp (.261) went 2-4 with a double and BB. #17 Cordero – DL, rehabbing at the Complex in Clearwater. #30 Lively (3-2, 3.86) – DNP. Reading (61-24) Beat Richmond, 9-7. Rhys Hoskins’ 2 home runs and 6 RBI carried the Fightin’ Phils to the victory. His second 3-run HR broke a 6-6 tie in the seventh inning. Hoskins had 3 of the Phils’ 7 hits. Dylan Cozens contributed 2 RBI. Jorge Alfaro drew 3 BB. All Star Ricardo Pinto gave up 6 runs (4 ER). Joely Rodriguez (6-0, 2.17) blew his second save before being awarded the win. Hoby Milner (1.78) earned his 4th save. #6 Alfaro (.292) went 1-2 with an RBI (45) and 3 BB. #7 Quinn (.288) DL, oblique, rehabbing at the Complex in Clearwater. #10 Pinto – (3-3, 4.32) – 5.0 IP, 7 H, 6 R, 4 ER, 3 BB, 1 K.
#15 Eshelman (1-0, 5.40) – DNP. #18 Pivetta – (7-4, 3.31) – DNP. #19 Hoskins (.287) went 3-5 with 2 HR (24) and 6 RBI (75). #22 Cozens (.284) went 1-5 with 2 RBI (72). Clearwater (46-35) Walked all over Lakeland, 6-1. The Threshers were held in check for five innings. They didn’t get their first hit until Scott Kingery’s double in the fourth inning. One other runner reached base when Mitch Walding was hit by a pitched ball in the fifth inning. The Threshers finally broke through when Lakeland’s starter Matt Hall could no longer control his devastating curve ball. He walked the bases loaded in the sixth and was relieved with one out and a 1-0 lead. His replacement, Confessor Lara, walked in the tying run before getting out of the inning. Lakeland tried a new pitcher to start the seventh. Jairo Labourt loaded the bases with two walks and a hit batter. He walked in the go ahead run before leaving, and was ejected for something he said to the home plate umpire as he left the diamond. The next pitcher ended the parade of free passes temporarily, but did allow a bases-clearing double by Carlos Tocci and an RBI double by Zach Green. Will Morris (3.40) drew the start for the Threshers. He pitched well, holding the Tigers to one run on five hits and a walk over six innings. Victor Arano (2-1, 2.87) got the win but allowed 4 hits in his 2 innings. Ulises Joaquin pitched the final inning allowing 2 base runners and balking them into scoring position before recording the final out. It was an odd game in that the Tigers out hit the Threshers 10-3 while being outscored 6-1. All three Threshers’ hits were doubles. The Threshers drew 8 walks and 3 hit batters. The Tigers drew only two walks. Morris pitched a good game. It was only his second start in 7 weeks. He faced the minimum through the first three innings. The only base runner was a 4-pitch walk who was erased by a double play. Morris breezed through the first three innings throwing only 29 pitches. He gave up his first hit with one out in the fourth. It came as the culmination of a 10-pitch at bat. Morris pitched around two two-single innings in the fourth and fifth. The only serious threat he faced was a lead off triple in the sixth. Manager Legg opted to play the infield back (in a 0-0 game?) and the run came home on the first of three easy ground outs that Morris induced. Morris’ line was 6.0 IP, 5 H, 1 R, 1 ER, 1 BB, 2 K, 87 pitches/53 strikes. His fastball sat 88-91 mph, yet in the sixth he touched 92 three times and 93 once. #11 Kingery (.293) went 1-4 with a double an a BB. #12 Canelo (.246) went 0-4 with a BB, RBI (33) and 3 K.
#14 Tocci (.270) went 1-3 with a double, BB, and 3 RBI (31). #21 Garcia (6-2, 1.97) – placed on the 7-day DL retroactive to 6/28. Lakewood (34-48) lost to Delmarva, 14-2. Infielder Luis Espiritu was the most effective pitcher last night. He allowed no runs nor did he allow inherited runners to score. Damek Tomscha and Brendon Hayden had 2 hits apiece. #5 Randolph – DL, shoulder, rehabbing in GCL games in Clearwater. #8 Kilome (1-7, 5.23) – DNP. #20 Tirado – 5.0 IP, 4 H, 1 R, 1 ER, 2 BB, 7 K, 85 pitches/52 strikes. #24 Pujols (.235) went 1-4 with a HR (16), RBI (48), and K.
Williamsport (10-9) Lost to Connecticutt, 6-4. Ranger Suarez was effective in his five innings, holding the Tigers to 1 unearned run on 2 hits. The bullpen lost the game, giving up 5 runs in the seventh and eighth innings. #16 Medina (2-0, 0.00) – DNP. GCL Phillies (7-2) Beat the GCL Pirates, 5-3 in 12 innings. Mickey Moniak and “C” Randolph didn’t make the trip. In their absence, three catchers provided the offense. Rodolfo Duran went 1-3 and lowered his average to .385. Nerluis Martinez replaced him and went 1-2 with a walk, raising his average to .438. His single in the 12th broke the tie. DH Lenin Rodriguez went 3-5 with a walk. He provided an insurance run with an RBI double in the 12th. Danny Zardon had 2 hits and 2 RBI. Jhailyn Ortiz also had 2 hits including his second career home run. #? Mickey Moniak (.294) DNP. #25 Jhailyn Ortiz (.308) went 2-6 with a HR (2) and RBI (8). DSL Phillies (9-18) were shutout on 3 hits by the DSL Rays1, 7-0. Dixon Gutierrez (.323) went 0-3 with a BB. Keudy Bocio (.238) went 1-2 with 2 BB. Jonathan Guzman (.305) went 1-4. DSL Phillies2 (12-13) Lost to the DSL Rangers2, 5-2. Leonel Aponte (2-2, 3.16) DNP. Carlos Oropeza (.232) went 0-0. $190,160 remains available for over slot payments until we learn any other over slot bonuses to prospects like Andrew Brown, Trevor Bettencourt, et al. Congrats to Crawford for his first HR .Hoskins with 2 hrs , Alfaro with 3 walks now that’s Amazing.Luke Williams with a blast Ortiz with his second. Can’t wait to see the Crawford , Kingery , Franco , infield. And to complete that future infield, Rhys Hoskins. The T J thing has me 7 in the air with first base. Right on cue, Alfaro takes 3 BBs. I think I read yesterday, on this site, that someone was nervous about Alfaro’s lack of BBs. I too was nervous about that. but in his last 3 games he has 6 BBs. It looks like something he’s working on and that’s what I like. In April, when he hit .500, he had 1 BB and 6 Ks. In May he had 1 lonesome BB and 17 Ks. In June, it got worse, 3 BBs and 27 Ks. In July, he flipped a switch. He has 6 BBs to 5 Ks. He’s only hitting .154 in July but his OBP is .421. Zach Green is leading the FSL in RBIs. Kingery leads the league in hits, runs scored and doubles. Don’t even need to talk about Hoskins and Cozens, who are having their own private bash party every night. Wait… I just talked about them. Ahh, short season stats. Jhailin Ortiz was hitting .217 with 0 HRs just 2 games ago. Suddenly he’s hitting .313 with 2 HRs. On the other side of the ledger, Caleb Eldridge, the round 209 pick in the 2016 draft, went from .273 to .176 in one game. Round 20 pick… was Caleb Eldridge. Sounds like Yoda. Senzel interestingly was sent to Rookie ball for 41 PAs and then moved up to the Reds Low A team. He is off to a slow start through only 59 PA’s. And looking back, if we’d have drafted Groome we’d be dealing with drawn out contract negotiations and threats of attending a JUCO up until the deadline while other top picks are already playing in various lower leagues. Still in shock that Groome wasn’t the choice. Not necessarily. If Groome (or anyone else for that matter) had been the 1:1 choice, the negotiations would have started at much higher numbers than where the Red Sox were able to start. 1:1 money money really leaves the selectee no leverage. How can a kid turn down $6 million? Or $5M? Or, even $4M if that’s what an organization decides is his value? Don’t you think the Sox had preliminary talks with Groome’s reps prior to the draft as well? I sincerely doubt that they just drafted the kid and said to themselves “we’ll work out this pesky money thing at a later date”. You can’t afford to do that under the new system. Rick- maybe they viewed everyone else available as weak and saw next years class as superior so they decided to take the risk. It’s not like they are gonna lose out on a first round pick they still get one next year if they don’t sign him. On the flipside of that coin – why is Groome chancing going to JUCO in order to come out again in the ’17 draft which as you say is stronger. His threat to return to college won’t hold water at that point. The Red Soxs didn’t talk to him much (I can tell you that for a fact) because they never thought he would slide that far to them. He’ll go to Chip in FL and come out again next year . . . I said the day after the draft that he won’t sign w the Sox and will go back into the draft (that wasn’t just my opinion). Btw I think Kyle Lewis is hitting under .250 tho . . . Right, my question/ point is how is that a good move for Groome? Leaves $3+ million on the table, confirms rumors that he and his camp are difficult to deal with, takes the chance of injury / lowering his draft stock with this JUCO performance, and comes out in a stronger draft. Why would a team deem him worthy of a top-10 pick and an over slot payment he so clearly thinks he deserves? Is he going to threaten to go back to JUCO in Florida? there was discussion in some circles that Groome camp behavior was just looking for single pay day and there were concerns about long term viability. That scared some teams away. It’s playing out like many felt it would. Cozens and Hoskins..Wow! I’m not a scout or a coach,but what do they have left to prove in double A? What’s the point in putting up record breaking numbers there? I say,move them up to triple A after the all-star break,challenge them,after all if they make the agjustments there, put them on fast track to the big leagues,lets expedite this rebuild! I get this point, but also why rush them? They are not going to play in the bigs this year most likely, so why not let them stay together, and finish what they started in AA. It would be ashame for many of the young guys to have the most dominant team in pro baseball and tear it apart before their playoff run. Let them get a taste of winning meaningful games. Agree 100%. They have no chance of playing in Philly next year so why move them to LHV now? Let them play the season in Reading, gain some experience playing together while winning (a lot) and them start them in AAA next season. The rebuild moves at its own pace. Artificially expediting it through lack of patience is a really poor idea. Why is there no chance Hoskins can play in philly next year. WHY. I don’t understand.. How can you can make that statement? if he is moved up now and is good. then he would be in the picture for next year. Part of rebuild is to see what you have. Keeping a kid in double a who is killing the ball tells us nothing. the real test is triple a. Why is Triple A the real test? More veteran pitchers You get a better read on kid in triple a. Versus bandbox reading park. Guys who can hit at triple a to me are more likely. to go on to help big league club. Not all the time. but triple a is harder with so many veterans who know how to work a kid . LOL, how is AAA “the real test”? @roccom – i think most of the very good prospects are in AA. AAA is full of rethreads and journeyman. Teams will deep farm are the ones who keeps a talent laden AAA team – and on the pitching side, 1 to 2 very good prospects + some veteran placeholders. so i don’t think AAA really is the ultimate challenge in the minors. I give Hoskins a good chance of playing in Philly next year that doesn’t mean he has to be moved to AAA this year. Big difference in Pitching between both leagues and both stops need to be made IMO. AA probably has more FB velocity and probably less command of secondary pitches where as AAA you probably see less velocity but more command of the off speed stuff. I want Hoskins to stay a part of this playoff run the Fightins are going to make and then next season he can start in AAA. If he tears it up there then he could be in CBP by June. agreed. and it will come down to how well Joseph is doing assuming he starts next year at first base, and how well Hoskins does in AAA. If both are hitting, thats a good problem to have. they absolutely can not move them up now because I will be seeing them next week in trenton. Just hoping team isn’t hitting some slump after torrid start. I was in REA last Sunday (Jul 3) and sad too see Eshelman and Rivero struggled big team. REA was down early but I’m confident that the REA wrecking crew can climb back and they did!! i also scored a Fightin Phils Independence cap which is nice! Although it costs me $35 – the lady gave me a Schmidty and Nola bubble heads!! is Jul 17 the JPC golden bubblehead night?! I should be there then! Trenton is an awesome stadium too. Blast to watch games there. I’m there at least on the 16th. I may also go either the 14th and 17th. I think there is something to be said for finishing a level start to finish and learning how to sustain success over a full season. Too often we reward a solid month or two and then you wind up with a kid in the big leagues who doesn’t know how to get out of a slump or manage the ups and downs of the league adjusting to them. I think the real development takes place after you’re facing pitchers who have seen you 3 and 4 times through as ultimately that is what will happen once you get to the big leagues. Dmar I believe it depends on the kid. Can he handle failure, some kids cant handle it and, I believe are more more slowly. Crawford isn’t one of them, he was move pretty fast from double a to triple a, He must be more mature than his age, would let you believe. Crawford has a very under rated part of his hit tool that allowed him to advance quickly and that is his “eye” or “plate discipline” he rarely gets himself out, rarely chases pitches out of the zone blah blah I could go on and on. But your statement is very true some kids don’t handle failure well. I don’t think that will be the case for Cozens or Hoskins. There’s also that trivial little thing of JPC being an elite prospect and Hoskins and Cozens not. Rhys and Cozens are very different quality of prospects IMO. Rhys has a far superior statistical breakdown. He has really no statistical “red flags”. His biggest flaw is that he is a 1b defensively. Cozens on the other hand has a .650 OPS against LHP and a .740 OPS against both sides pitchers away from Reading. Those are major red flags. He also has an extremely high K rate. I am much higher on Rhys than Cozens. ‘His biggest flaw is that he is a 1b defensively’. …specifically a RHB 1B. If he were putting up those numbers as a LHB he would be close to the top first baseman in the minors. And would be, IMO, ahead of Sam Travis the only RHB 1B in the MLB.com top ten…at number ten..
Romus is that Travis related to the guy at the Alamo?? Agree that he’s not the same quality prospect offensively as Hoskins, but Cozens is a better athlete, who plays a more valuable defensive position and plays it well. Rick…..Cozens is the better athlete, however, do not short sell Hoskins’ defensive abilities at first base. From all accounts he is a better than an average defender there. The positional value is, nevertheless, what it is and RF holds the ‘higher’ value according to Fansgraph..
Oh no, that wasn’t my intent at all. I’m well aware of Hoskins ability to play 1B well. My point was that Cozens ability to run and throw at an above average level are also valuable. BTW, have no idea how Fangraphs rates LF and RF equally. Here is something they put out on positional rankings. that certainly supports Matt Klentak fascination with rebuilding team thru middle. V1, even if Cozens needs to sit occasionally against LHP he can still be a major force at the MLB level with his power. a platoon hitter who is limited to only a corner OF spot defensively is not an extremely attractive ceiling for a prospect. Cozens does hit RHP much better than LHP but about 80% of MLB pitchers are Right Handed so there is still a place on the Phillies to use his power. To me the worst case is a young Ryan Howard whose career was very good until 2011. Wait, Cozens is going to hit .300 with 50 homers? Oh well then by all means, he’s an elite prospect. If a young Ryan Howard is Cozens career tragectory or worst case scenario we are in wonderful shape. However I think that is a pretty bold/misinformed statement. Howard was only good until they started shifting him. Then he was below replacement level. The game of baseball has changed. I’d say it was more than just the shift that beat Ryan Howard. Nah I don’t think that’s true of Howard at all. He had bigger problems than the shift. He never had good pitch recognition skills or good command of the strike zone. Lots of guys are seeing the shift today and their careers aren’t falling off the cliff like his did. His career nose dived after the Achilles. His lower half was never the same. What’s the shift for hitting HRs? the HRs were great and it is true that the Achilles injury sapped him of his power. but even with the homers, he was on a path to be a sub .240 hitter once the shift started becoming a regular thing IMO. Worst case for Cozens is a young Ryan Howard? You mean like when Howard hit 50 HRs and was league MVP? LOL, that is funny. Cozens’ splits compared to Hoskins’ are part of the reason why I would like to see Hoskins get a shot at AAA this year, but I expect Cozens to stay in AA. The other reason being that Hoskins is a year older. I think with most prospects that are on the older side, it’s good to be a little aggressive when they perform well, as Hoskins has. Still, I could understand if they decided they wanted to give Hoskins more time where he is. His June was much better than his April/May and his BB/K still raise some concerns. Maybe they want to see him sustain the improvements he showed last month for a bit longer. I wouldn’t move either one right now. Its pretty special what they are doing and certainly building confidence (which is more important factor at that stage). …I guess he will be on playing this week sometime on one of the DSL teams. DMAR…I guess, the typical 17-year old Ven kid it would appear. Now if he were Cuban…then I would be a little worried…for at 17 they are built like other LA country 21-year olds. Their player development system is quite impressive for an island nation with such a low population. They start those kids at a young age in a very good development system that feeds into their professional league. Hope he can come close to the Jacoby Ellsbury comparision that some scouts have projected. Great pickup by the Phillies and even better that we signed away from Boston. To the ..Why rush them crowd..WHY hold them back?? Just because you move them up one level,doesn’t mean they can’t learn or make adjustments there. Hoskins is still young for his league by 1.5 years. And will be young for AAA next year when he’s there. Cozens clearly has things to be working on in AA, hitting LHP for one, and a promotion isn’t warranted. 2016 in AA sounds right for both of them. Hoskins is 23, Cozens 22. Hoskins is not young for AA ball. Then I guess Baseball Reference is wrong when they list him as 1.5 years younger than avg for his league. My bad. Hoskins is young for the average player in aa but he is probably average for prospect age at aa. Thanks for clarifying! You said it better than I did. V1 does a great job above explaining Cozens and his alarming OPS numbers against lefties. Let’s add he strikes out nearly 40% of the time against lefties. And again I’m not trying to rain on the kid what he has done as a young 22 y/o in AA ball to this point is super encouraging. Just b/c Stassi “isn’t the future” it doesn’t mean that Hoskins is ready for a move to AAA. One has absolutely nothing to do with the other. Cozens has no business being at AAA at the moment with those splits and the FO clearly agrees. OH forgot you a scout sorry. Stassi shouldn’t be blocking him is my point. What can Hoskins prove at double/ a nothing. He is dominating it. so I guess we have to wait longer for him is your point. I don’t get what he is proving playing at reading now. If anyone thinks they are a scout it’s you Roccom. I’d imagine that 75% of the commenters would agree. B/c I’m not a scout I can’t voice an opinion on a player on a website dedicated to prospects for my organization? BTW, several people have already stated exactly why he’s still in AA – you just disagree. Or in your own words, don’t understand. Either way, irrelevant. You’re a very hostile person when someone disagrees with you. Drop the attitude bub. Most of you guys have Rocco all wrong he’s as soft a guy as Dom Brown was! I think this is a time to be positive about the player. He is in special place right now. I even saw that he took 3 walks other day (I believe he did it twice last week). @Barf – so who are you kicking out in AAA to give way to the HR Crew? Move Knapp to the Phils, DFA Ruf, release Stassi and Lough? These change will happen within a couple months so just chill and let the pieces fall into the right places. We’ll see the new “core” together sooner than later —- with the 2017 Spring Training as probably the preview. As to the “working/isn’t broke”and “already successful” thing —- not because the HR crew are successful in filling stats (and leading the league) doesn’t mean that they are already “finished products”. they key to success is “consistency and sustainability”. without proven track record against the highest competition, there’s always something to prove and improve. that’s why we call them prospects — their value is based on their tools and projection and these prospects still have some projection left, which means that they need to continue working on some aspects of their game to meet their projection – pitch recognition, plate discipline, consistent contact and mental toughness are some of the few. You need to look beyond the fantasy stats like HR, RBI, Ave and alike to say that a prospect is successful. Kurds-Wonderfully written and a lot of great points thanks for that post. Chad must get you mad. How many times I am right. I could care less what you or blanket think. Tell us, how many times are you actually right? I’m not made just stating an observation. What exactly are you right about? Except by replying to him you’re negating your previous statement. If you didn’t care what he thought you wouldn’t reply to him so you must care at least to some degree. Romulus- Im not sure if you are referencing me in your posts but I don’t believe I’ve ever told Roccom that I didn’t care what he thought. For as often as I disagree with him I value his opinion and he brings interesting information to the table. @Chad I was not referencing you, but was referring to roccom’s statement that he doesn’t care what you or blanket think. Romulus- Sorry I’m always on this site on my phone and it’s tough to see who gets replied to. Zach hasn’t been able to stay on the field and for a guy that’s been moved off of 3B to 1B is power profile has failed to show up. Only once has he OPS’d over 800! Agreed. If he’s done as a 3B and now truly a 1B, he has almost no value as a prospect. Bash brothers..My point is, move them up to challenge them,I don’t think they’ll make as many adjustments in double A as they “may” in triple A against better competition. Won’t play in the big leagues next year..they probably won’t if you keep them in double for the rest of this year..
Young for their league? Since when do you move prospects according to their age? We get your point. I think the reasons for keeping Hoskins in AA are pretty viable as stated above and the FO will promote him when they see fit. The reason for keeping Cozens in AA is b/c he obviously isn’t ready for AAA with his L/ R splits. This isn’t happening. @braf – AA is still talent laden and for some (and probably more) teams, their best prospects are in AA not AAA since most likely than not, AAA teams consist mainly of MLB rejects, journeymen, placeholders and older prospects — only teams with deep farm can have a talent laden AAA team. So an AAA level, does not necessarily mean another level of challenge that you are talking about. That’s why some of the really good prospects jump from AA to MLB. As I mentioned earlier, you need to look beyong the Fantasy stats. Alfaro (admitted that he) needs time to work on his plate discipline and framing (not measured by stats), Cozens needs to improve his splits (which is normally a good red flag indicator) and Hoskins – as a RH 1B, the Phils have previous RH 1B that terrorize REA before so it’s not new. Although us fans view our prospects higher than most, the HR Crew are not considered Top (30) prospects in all MiLB by the experts which should give an impression that the are “risks” that are high enough that lowers their value. The higher the risk – the more development you need. Kurdt- More great points thank you for the info. I think we as fans sometimes overreact to very sss and use them as the gold standard. Perfect example is the Kingery freak out that happened a month or so ago when people were worried about him hitting 250. I’ll be interested to see if and where some of the Phillies prospects rank at the end of the year in their respective leagues. @Chad – tnx! That’s why we need the likes of Jim and other fans who watched the game live, see the players play and give actual field reports about the performance. There are things beyond the stats and indivdual rankings. Maestro- I think you missed the spirit of the argument. No one was saying they are gonna be bad players just that they have areas they need to work on. Honorable Mention … Greg Pickett. Still waiting for him to get healthy. I remember reading he put on a HR display (multiple upper deck blasts) at CBP when the Phillies brought him in for a pre-draft workout last year. Hinkie- pure power or game power? I was thinking more or less how they would fare when/if they make it to CBP as a Philadelphia Phillie. In a pure dream world were almost everything goes right. Not a ton of power in our system but definitely respectable considering a lot of the players listed are close to the majors. I will have the same Top 5 but have to agree with Hinkie that Hall and Pickett should be Top 10 and TJ should be higher. Bryan Martelo is the other one that I thought can be a source of power, but was let go earlier that I expect. Jhailyn’s middle name is David – so if he has some Big Papi in him, then he will be a fast riser. In SSS, I’m starting to be intruiged to what he can become. Jose Pujols can reach the HR record mark in Lakewood that says something . He has 48 rbi’s too his swing and miss is crazy but boy when he connects. Hinkie….Encarnacion?..the name alone signifies power. Yeah I forgot about him. He’s defiantly in the top 10. He’s probably right there at the back end around 8ish. I’m waiting to see Cozens and Hoskins each get 120 RBI’s at Reading. Wayne- think they can get to 40 HRs? too bad the game was delayed before Ben gets his 1st at bat. we all know about the Top 2 picks in 2015, but it is pick #31 (Fanti) and #34 (Ben) are the ones i’m most intruiged the most. KuKo…many good points today….. but really! @Romus – i just collect as much as I can especially if it’s free but i’m not a serious collector. I also watched the Phils during the Maikel Franco bubble head last June 18 – so I got 3 (Franco, Schmidt and Nola) in the last 3 weeks. Kurt..I’m Not looking past the stats..I realize they have things to work on…As a player WILL they when they’re having success like that ? Maybe..but I doubt it,hence challenge them by moving them up a level,until they face adversity.. why make adjustments?? I realize that they’re Far from a finished product..my point is by moving them up,hopefully that would expedite the path to a finished product! In business..have you ever heard the term..fat and lazy?..business’s need to trim the fat to get better,and that usually happens quicker during challenging times. Barf- Most prospects understand that they should do what the coach is telling them to do. I’m sure the coaches are telling Cozens to work on hitting lefties as he is not very good at it and he is facing adversity now in aa. What makes you think that a move to AAA would make him work harder at hitting lefties when he would be having a harder time hitting righties. I think Hoskins is closer to moving up however his k/Bb is not as good as it has been in the past I’m sure there are other things that the Phillies want him to work on before he goes to aaa. “why make adjustments” – the farm system is all about player development. the stats are not used to determine a HOF career but to determine some areas that needs to be improved on top of the ones visible to the eye (i.e. noise bat, balance, etc). so prospects (and their coaches) make adjustment as they go up the minors. “expedite the rebuild” – the best way to expedite the rebuild is to a) spend resources in scouting, player development and infrastructure; and b) acquire as much good talent. use the resources to aid the development of the players (use stats to determine red flags, database for analysis, get the best coaches, etc). there’s no shortcut to success that’s why good FO set timelines and put resources into it. the Amaro regime failed because he overstretched and use all the resources without leaving any to scouting, player development and infrastructure. “face adversity” – most good prospects (and potential regular MLB players) normally spend their time in minors “making the necessary adjustments” to prepare themselves for the “ultimate adversity” which is the MLB. “challenge” – challenging the prospects not necessary mean to play against the best players (it is for most part but not always). for coaches, challenge sometimes mean that you have to make/help these prospects reach their potential and develop a mind set that will help them succeed – is regardless of the opposition (other top prospects, AAA, journeyman, placeholders, etc). “business” – i don’t know what you’re talking about when you fat and lazy – but i know the cliche. Most of the lazy people i know, were fired. IMO the Minors is all about player development and make up – in other words prepare these prospects for the ultimate challenge and adversity which is the MLB where the best of the best are playing. Kurdt, that was excellent. As good an explanation as I have ever read. Matt Hockenberry assigned to Reading Fightin Phils from Clearwater Threshers. 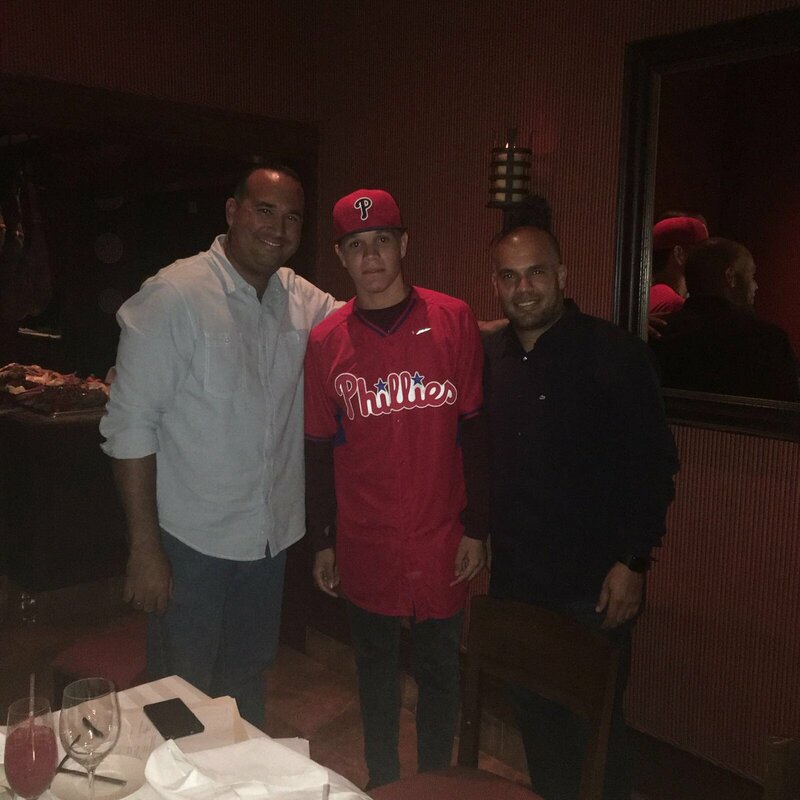 Ismael Cabrera assigned to Clearwater Threshers from GCL Phillies. Philadelphia Phillies sent RHP Andrew Bailey on a rehab assignment to Lehigh Valley IronPigs. Was there an injury in Reading or is Hockenberry getting promoted? No he deserves it , has been doing very well in Clearwater. I said it two weeks ago. I Knew Franco would adjust. Saw him do it a reading, at lvh. He just gets into a little funk. then bam figures it out. Only 23. has a chance along with Herrera to be the foundation on the way to a championship. I think I am at point of just accepting Franco for what he is and that’s a very streaky hitter. I tend to like streaky hitters because they are blast to watch when their locked in. That’s a really good illustration. That’s what we gave up to acquire all our assets 2009-2011. We didn’t “empty the cupboard” with those trades. We had serious problems with our farm system talent regardless. I Just wish we had villar. What a player he has become. 28 sb. hitting 300, with 380obp. good fielder. A borderline allstar. When you trade prospects, eventually, some of them might pan out. Don’t beat yourself over it. I’m sure you’re ok with Anthony Gose (who was the better prospect at the time) not working out. I’d be much happier with this lineup compared to our current one. I’d say that Singleton would probably be at first instead of Howard. Dmar Right now I am so confused. Your right, I was not a asche fan. Thought he was a 250 hitter with 12 to 15 homeruns. With limited defense. Right now, I couldn’t be more wrong. But I hope he keeps it up. I wonder if he can. but Listening to Matt Stairs he thinks , he Is going to keep it up, he loves his nice easy swing. Been wrong before. What happen to bourjos that isn’t the guy I watch before?. Rupp is hitting like he did at Texas, that right center and right field swing. I’m not fooled. I think Cody and Bourjos are nice role players and if you had a star in the other 2 OF spots you could probably get by with those guys. they both seem like really nice guys so it feels good to watch them succeed on this little run they are having. I’m really impressed by Rupp as well. In my world he is the ideal prototypical back stop. Big presence decent enough offense but not so much so that you would have to count on it night in and night out. When Philly trade Singleton in the Pence deal I really thought he was gonna be great and he had great sss in the majors then the wheels came off. Not sure what his issues are as I haven’t followed him but I’d imagine he has a long swing. I still hope for the best with him as I’d like to see all former Phillies succeed. Sometimes prospects don’t pan out. And Singleton had marijuana issues.